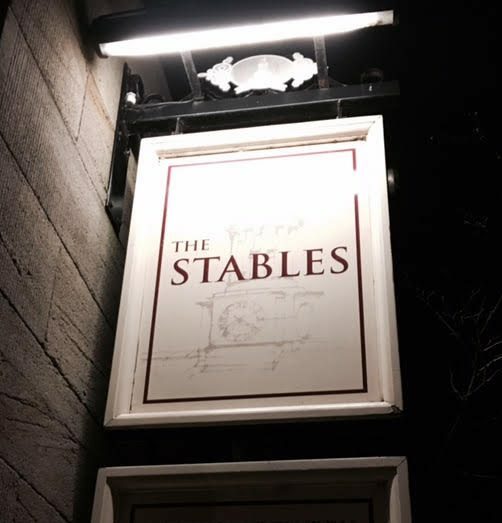 The Stables, Beamish: Proper winter-warming gastropub scran! I’ll come right out and say it: I detest this time of year. Cold, wet, dark, miserable… and diets. I’ve recently signed up for the Joe Wicks 90 day plan, which for a food blogger is content-creation suicide, but as I’m sure you can appreciate, all those meals out sure as hell catch up with the old waistline. 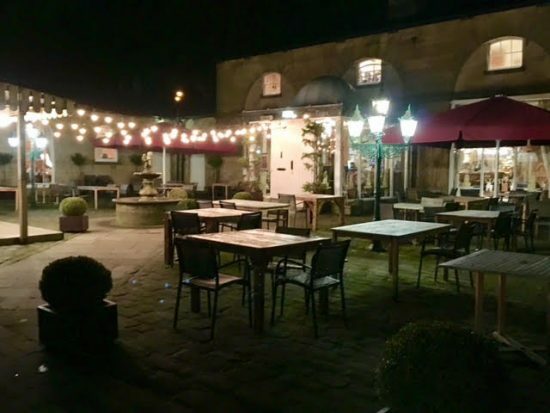 But still, a gal needs a treat, so a couple of weeks ago we decided to head out to County Durham to experience dinner at The Stables and a night at Beamish Hall Hotel. I’ve been to Beamish Hall only once, for a wedding, but never got to eat anything other than some classic buffet fayre, so I was keen to check out their highly-praised restaurant, The Stables. We visited on the Thursday evening at the end of January, and despite the restaurant being relatively quiet, they succeeded in making it seem busier by closing off one half of the venue. We were welcomed by an extremely friendly and professional bartender, who showed us to our table in their cosy dining room. The dining area is tastefully decorated, with nods to the old use of the building, The Stables (well, duh!). 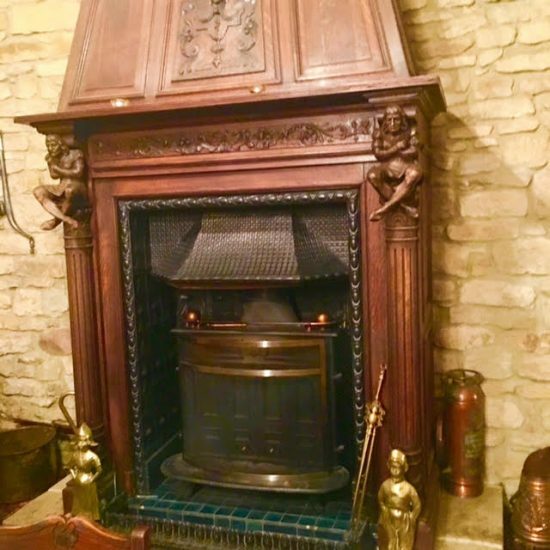 There are huge welcoming fireplaces, rescued from old country manors and given some TLC to restore them to their former glory. Furniture-wise, it’s all about simple wooden tables and chairs, mismatched to add a bit of character, and beautiful original beams with exposed stone walls. The restaurant has been open since 2009 and the kitchen is headed up by David Race. The team of chefs are committed to utilising the best local produce and suppliers to create delicious dishes that aren’t extortionate. It’s an approach that’s obviously working well, because during our visit to The Stables I noticed the smiling faces around the restaurant and the lovely, content atmosphere. Our waiter for the evening, Paul D (not of Beastie Boys fame, I’m just assuming there are two Pauls) was probably the jolliest man after Santa. He was so enthusiastic about the menu and The Stables overall, whilst his enjoyment of his job was evident to everyone in the restaurant. 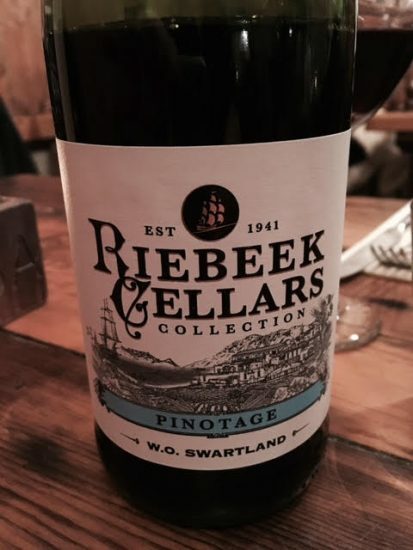 He chatted us through the menu, gave us a couple of pointers on his personal favourites and complimented us on our wine choice (Riebeek Cellar Pinotage, £20.95) before heading off to see to the rest of his designated tables. 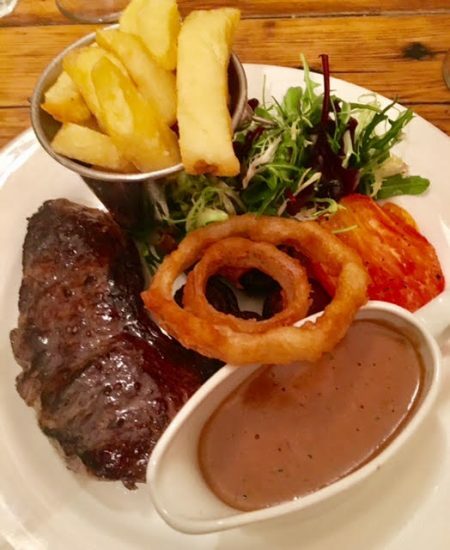 Their menu is a classic quality gastropub offering, using locally sourced produce, with plenty of winter warmers, classic burgers and a number of steaks from the grill, all reasonably priced. What more could you want? 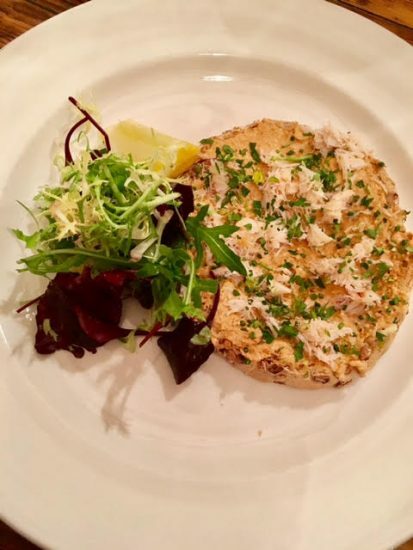 We skipped on the nibbles and went straight in with the starters, with me opting for the Northumbrian Crab on “Silver Buckles” bread (£6.95) and my boyfriend going for the Firecracker Prawns, served with a Sweet Chilli Dip and an Asian salad (£7.25). My Northumbrian Crab dish was deliciously fresh and well seasoned. The delicate flavour of the crab only needed a little splash of lemon and a sprinkling of cracked black pepper to make it a 10/10. The bread, which I was relishing since it was the first time I’d eaten bread in WEEKS, was flavourful and packed with seeds, and I could tell it was fresh from the bakery. The bread is made on site using yeast from the adjoining microbrewery, a great personal touch. I forgot to ask if kitchen staff at The Stables make their own bread or buy it in from a local bakery, but a quick glance of their website tells me that in fact they do make it on site, which is something I’m a big fan of. I was particularly impressed with the volume of crab given, so I didn’t have to ration it, and the accompanying leaves added a bit of crunch. All in all, a really great starter, and just as good as the crab on the menu at The Broad Chare, which is a personal favourite of mine. The firecracker prawns were a similar success. Four huge, glistening king prawns in a light (but fiery!) 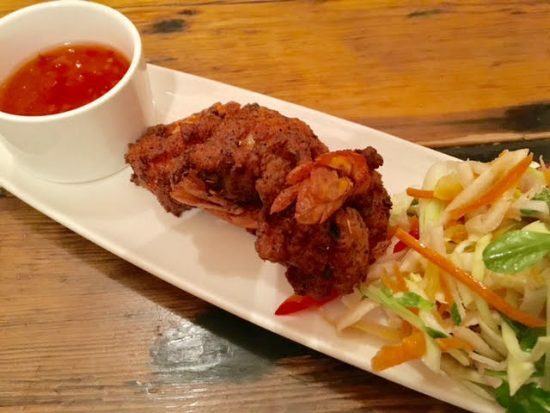 batter, served with a punchy sweet chilli sauce and an Asian salad. My boyfriend reluctantly gave me a forkful to try and I momentarily regretted not choosing them for myself, they were that tasty. The only slight annoyance with this dish was the plate it was served on… a really narrow plate that made for quite messy eating, considering the Asian salad kept on falling off every time he cut into something. I couldn’t fault them on flavour or quality, but a little more space on the plate and you’d have an all-round winner of a dish. We were given around a 10 minute gap before main courses arrived, and after the resounding success of our starters, I was anxious to see if The Stables would deliver in the next round. We’d deliberated for some time over the menu, and there’s a bunch of choice to suit all tastes and dietary requirements, but I was struck immediately by the Trio of Artisan sausages and mash (£11.95), because it was cold and wet outside and I swear by this dish for making the world seem a better place. It just cannot be faulted. Or can it? Well not in the case of The Stables, let me tell you. 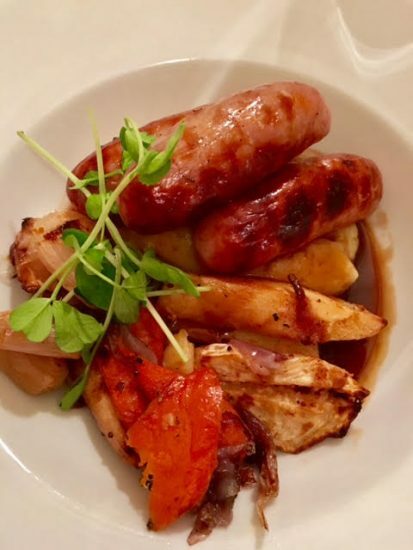 A trio of succulent sausages piled onto buttered mash, roasted shallots and winter veg, with Northumbrian ale gravy. Not enough gravy for me, mind, but that wasn’t a problem. Almost as soon as I’d asked for extra gravy, a mini boat just for me arrived at our table. The sausages were incredible, I was told they get them in from the Northumberland Sausage Company. I for one will be ordering some for my own kitchen, they’re bloody wonderful. Not sure how they were cooked, I highly doubt they’d been grilled because I always find that dries sausages right out, and each one was full of flavour and super moist. The mash was perfection, too, with not a lump in sight and the light flavour of salty butter beneath. The veg was crunchy, the shallots tender and slightly caramelised and the gravy full of flavour. I could go on and on about this, and I did to anyone who’d listen the day after. I know it’s “just” sausages and mash, but you can’t help but rave about it when a failsafe classic is done so right, right? I should mention, throughout our starter and main courses we were checked on by the super canny Paul, as well as a couple of other members of staff, and everyone was so professional and charming. We didn’t want for anything the whole time – our wine was topped up (and we were easily convinced into a another bottle!) and Paul in particular was so accommodating whenever we had a question or a request. We both got the feeling that he makes it a personal quest to ensure every diner at The Stables has a really lovely experience and I’d say that he succeeds in doing so. My boyfriend chose the 8oz Sirloin Steak with proper chips (£18.95) and the Madagascan Green Pepper sauce (£2.50), which were accompanied by the classics: roast tomato, mushrooms and crispy onion rings. In his words, it was all “bloody awesome!” and after a quick nab of some steak, I’d have to agree. It was a great cut of steak, with very little fat, and it was cooked just how he liked it – the perfect ‘medium’. I also pinched a couple of chips (again, it had been a while!) and they were also really good. Diners can choose from these or French fries, but I have to say I’m a proper chips girl, myself. While the sauce was truly delicious, I do always have a problem with a little boat of sauce being charged as an extra, although £2.50 isn’t so bad when you compare it to the likes of “steak house” Marco Pierre White, but let’s not talk about that place again. This is a positive space. I’m going to go out on a limb here and say that he’d 100% order the sirloin steak again should we visit The Stables again, which after the two courses each we enjoyed, we most likely will be. 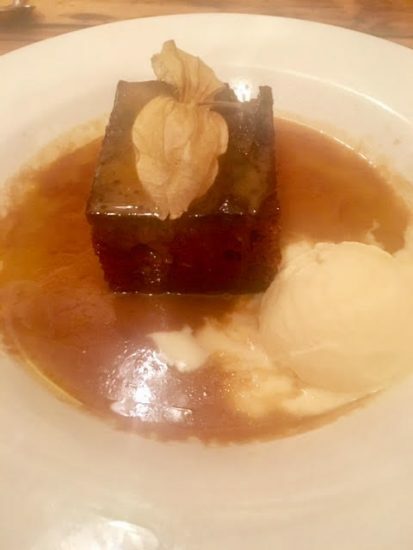 We even broke our ‘no dessert’ rule, with a little convincing by Paul, opting to share the Sticky Toffee Pudding with Vanilla ice cream and Butterscotch sauce (£5.25). It arrived on our table steaming hot with plenty of said butterscotch sauce and a generous helping of vanilla ice cream. If I’m honest, we barely made a dent in it, given the generous starter and main course portions, but what we did try, we really enjoyed. The pudding itself was moist and clearly very fresh, and despite not being much of a ‘dessert person’ (not to go on about that again!) it was a really lovely end to our meal. Finishing off with some cheese was tempting, but I would have no doubt exploded, so we left it at the dessert and enjoyed the rest of our second bottle of wine the bar area. Paul also showed me around the other side of the restaurant, which I’m told gets absolutely packed out, particularly on Sundays. The decoration throughout is consistent with The Stables and Beamish Hall’s history, and I couldn’t help but notice the lovely welcoming atmosphere no matter where we were. 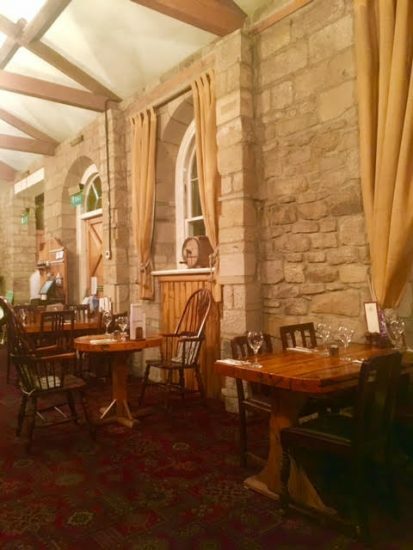 With both impeccable food and service, as well as what seemed to be to be really reasonable pricing considering the quality of the food and variety on offer, and if you’re prepared to make the trip up to Beamish Hall, you’d be sure of a delicious meal. The cost of our dinner was included in our overnight stay, so we only paid for drinks, so it’s well worth checking out the offers and packages available at Beamish Hall here – you won’t be disappointed! The Stables, part of Beamish Hall Hotel, Stanley, County Durham, DH9 0YB. I’ll be uploading a review of our overnight stay in the coming week, where you can read about the beautiful rooms, gardens and their delicious breakfast offerings, so keep your eyes peeled for that! Big thanks to the team at The Stables, particularly Paul D, for making our experience so enjoyable. We can’t wait to return for Sunday Lunch soon! Previous Post Chaophraya Newcastle Review: The verdict on the Toon’s newest Thai spot! Next Post Festival on the Wall is coming to a field near you!